The 3 Days Uganda adventure safari tour takes you to a place of many little birds perfect for Uganda birding safaris; Lake Bunyonyi that tourists have referred to as the loveliest lake in Uganda. Lake Bunyonyi is made up of over 29 islands, surrounded by steep terraced hillsides giving it a magnificent view. The lake is undoubtedly a magical place, especially in morning as you watch the mist rising off the placid waters making it a perfect place for travelers to chill out on Uganda safari. The lake has a selection of elegantly remote beautiful places on its distant islands where you have only the birds for company. After an early breakfast, you will be picked by your driver guide and depart Kampala by 6am and drive to Lake Mburo National Park. You will Begin with the game drive and this is the only place where you will find the biggest antelope; Eland, Zebras and Impala’s from which Uganda capital Kampala was named. Lake Mburo National Park is the only park in Uganda that contain an entire lake which offers diverse scenic views of beautiful hills and valleys, buffaloes, hippos, crocodiles, and a variety of bird species. You will have an early lunch at around 12:30 pm. After your lunch, you will have a 2hours boat cruise on Lake Mburo after which you will continue and proceed to Lake Bunyonyi. Arrive in the evening, check in to your accommodation, have dinner and spend your overnight there. After your breakfast at the lodge, you will kick your day off by taking self-guided forest walks around, take a self-canoe ride, bird watching, cycling in the hilly areas, and swimming in the lake. Bilharzia is reliably reported to be absent from the lake, as are crocodiles and hippos, which means that swimming is very safe. Later in the day, have lunch at the resort and in the evening take a boat ride on Lake Bunyonyi, visit the neighboring islands and get the history of each Island, you will also get chance to view various birds like the grey crowned crane, red-chested sun birds, and many flycatchers. Retreat, dine and rest at your lodge. 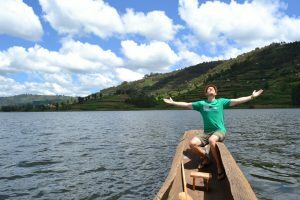 Breakfast at leisure, depart Lake Bunyonyi and head back to Kampala with a lunch stop at the Uganda Equator for some souvenir shopping, polar water experiment as well as photos standing in different hemispheres at the same time. Arrive in the evening in Kampala and check in to your chosen accommodation or transfer to Entebbe International airport for your flight.